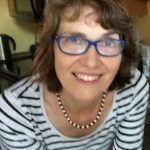 Iris Bork-Goldfield, chair and adjunct professor of German studies, has been elected to serve as the Northeast Region representative to the Executive Council of the American Association of Teachers of German. The American Association of Teachers of German (AATG) supports the teaching of the German language and German-speaking cultures in elementary, secondary, and post-secondary education in the United States. The AATG promotes the study of the German-speaking world in all its linguistic, cultural and ethnic diversity, and endeavors to prepare students as transnational, transcultural learners and active, multilingual participants in a globalized world. 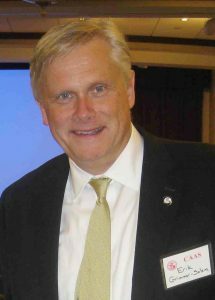 Associate Professor of History Erik Grimmer-Solem presented a talk, “The Wehrmacht Past, the Bundeswehr, and the Politics of Remembrance in Contemporary Germany,” at the meeting of the Connecticut Academy of Arts and Sciences (CAAS), April 12. 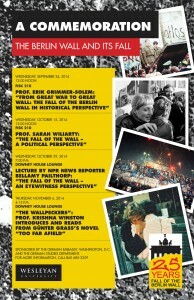 Grimmer-Solem also is associate professor of German studies and a tutor in the College of Social Sciences. His expertise is in modern German history with specializations in economic history, the history of economic thought, and the history of social reform. He has also developed research interests in German imperialism, German-Japanese relations before 1918, and Germany in the two world wars. Grimmer-Solem discussed his research, which uncovered the involvement of a Wehrmacht general, honored in public as a member of the military resistance to Hitler, in massive war crimes and crimes against humanity. He discussed how his findings were received by the German public, how that resulted in the official renaming of an air force base, and what that reveals about German perceptions of the war of destruction waged in the Soviet Union by the German army. The talk explored the deep involvement of the Wehrmacht in the Holocaust, the Janus-faced nature of many members of the German military resistance, and the ongoing problem of basing contemporary Germany’s military tradition and “official memory” on aspects of this tainted legacy. CAAS, chartered in 1799, is the third-oldest learned society in the United States. Its purpose is to disseminate scholarly information through lectures and publications. It sponsors eight monthly presentations during the academic year, hosted by Wesleyan and Yale, that are free and open to the public, allowing anyone to hear distinguished speakers discuss current work in the sciences, arts, and humanities. Leo Lensing, professor of film studies, is the author of a review essay titled “Fritz Lang, man of the eye. On the Edgar Allan Poe of German Cinema,” published in the June 15 issue of the Times Literary Supplement (London). 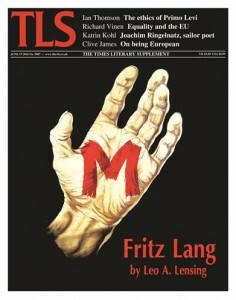 The TLS cover article takes stock of Fritz Lang. Die Biographie (Propyläen Verlag, 2014), the first full-length biography in German of the great Austrian-German filmmaker Fritz Lang (1890-1976), and compares it unfavorably with Fritz Lang. The Nature of the Beast, the standard American life by Patrick McGilligan. 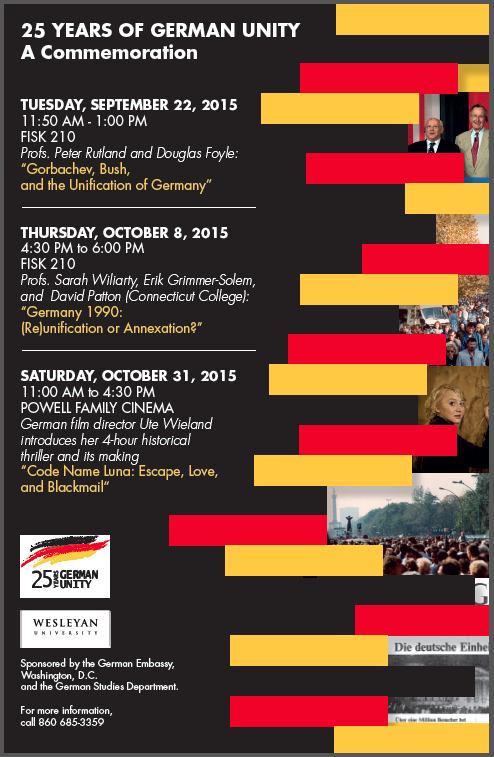 This fall, the German Studies Department and German Embassy in Washington, D.C. are sponsoring a three-part commemoration of “25 Years of German Unity” at Wesleyan. 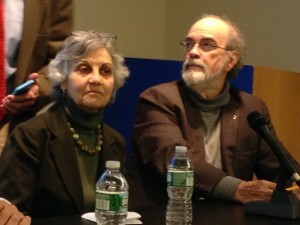 The series, which features discussions with a German filmmaker, a scholar from Connecticut College, and four Wesleyan faculty is made possible by a $3,000 grant from the German Embassy. The first talk, “Gorbachev, Bush, and the Unification of Germany” on Sept. 22 featured Peter Rutland, the Colin and Nancy Campbell Professor in Global Issues and Democratic Thought, professor of government, and Douglas Foyle, associate professor of government, who spoke on the important role that Russia, Mikhail Gorbachev, and the U.S. played in the German unification process. Krishna Winston with Breon Mitchell, another translator of Günter Grass, at a retrospective for the writer at CUNY Graduate Center on April 28. (Photo by Iris Bork-Goldfield). On April 28, Krishna Winston, the Marcus L. Taft Professor of German Language and Literature, spoke on a panel at the CUNY Graduate Center on Nobel Prize–winner Günter Grass, one of Germany’s best-known contemporary writers, who died earlier this month. Winston, Grass’s translator, is also professor of German Studies, professor of environmental studies, and coordinator of the Mellon Mays Undergraduate Fellowship. She spoke alongside Professor Friedrich Ulfers of New York University and Breon Mitchell, professor emeritus at Indiana University, Bloomington. The event, which was standing-room only, was moderated by Ralph Bunche Institute Director John Torpey, a professor at the CUNY Graduate Center. When the Nobel Prize-winning German writer Günter Grass died at age 87 this week, The Wall Street Journal turned to Krishna Winston, his translator, for perspective on his life. A commentary by Leo Lensing, chair and professor of German studies, professor of film studies, was featured in the Times Literary Supplement in January. The commentary focuses on Austria’s exploitation of Karl Kraus’s great anti-war drama, The Last Days of Mankind, to commemorate the 100th anniversary of the beginning of the First World War. Kraus first published the play in four special issues of his satirical journal Die Fackel (The Torch) in 1918–19. At a special Reunion & Commencement appearance with all ticket sales going to financial aid, Amanda Palmer ’98 played the piano and the ukulele and joyfully performed a set of her inimitable songs on the stage in Crowell Concert Hall on May 24. Her husband, Neil Gaiman, winner of writing honors from the Newbery Medal to the Hugo Award to the Will Eisner Comic Award, read from his work and joined Palmer in fielding questions from a rapt audience of alumni, parents and students. More information about Wesleyan’s THIS IS WHY campaign and upcoming events can be found at http://thisiswhy.wesleyan.edu. Book translated by Krishna Winston. 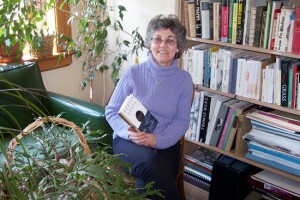 Krishna Winston, the Marcus L. Taft Professor of German Language and Literature, is the translator of Patrick Roth’s Starlight Terrace, published by Seagull Books in 2012. In a rundown Los Angeles apartment building—the titular Starlite Terrace—Roth unfurls the tragic linked stories of Rex, Moss, Gary and June, four neighbors, in a sort of burlesque of the Hollywood modern. In each of their singular collisions with fame, Roth’s dark prose presages a universal and mythical fate of desperation. 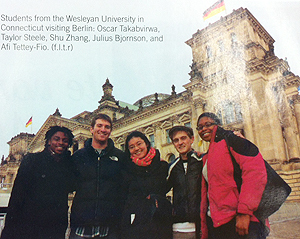 A group of Wesleyan students was featured in the Fall 2012 “Education Special” issue of the magazine German World. Shu Zhang ’13, Afi Tettey-Fio ’13, Oscar Takabvirwa ’14, Taylor Steele ’14, and Julius Bjornson ’14 were photographed in Berlin, while they studied abroad in Germany during the Spring 2012 semester. German World is distributed to classrooms across the United States.